The success of the SPEC Drug-Free program is illustrated through Chaparral Boats, Inc. Chaparral is a national manufacturer of powerpoats and luxury cruisers. The success of the SPEC Drug-Free program is illustrated through Chaparral Boats, Inc. Chaparral is a national manufacturer of powerboats and luxury cruisers. In 1996, Chaparral received its 18th consecutive award for product excellence from Powerboat Magazine. A high rate of accidents had plagued Chaparral for a number of years. Various safety programs had been tried with limited success. 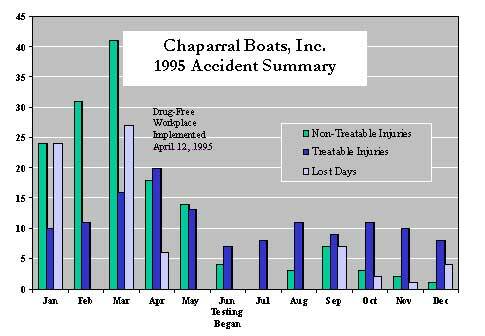 In February of 1995, Chaparral's Workers' Compensation insurer suggested a Drug-Free Workplace Program. SPEC Group was contracted to assist Chaparral in implementing the program. SPEC helped design the policy and program, assisted upper management through critical decisions, educated management and employees, and made the program successful. Turnaround time for full implementation and certification was less than 90 days. By the end of 1995, the program had proved more successful than the highest expectations. Chaparral experienced an 86% reduction in Workers' Compensation cost, a 25% reduction in accident frequency, and a notable improvement in product quality. In addition, the local Chamber of Commerce named Chaparral "Industry of the Year".